1,2,3-Trichloropropane is a probable human carcinogen that is present in the environment due to historic use as a solvent and current use as a precursor in chemical synthesis. TCP is mobile and highly persistent in soil and groundwater. TCP is not currently regulated at the national level in the United States, but maximum contaminant levels (MCLs) have been established or are proposed at the state level in Hawaii, California, and New Jersey. Treatment of TCP contamination using conventional groundwater and soil treatment methods is either ineffective or costly, but alternative remediation strategies are under development. Figure 1. Ball and stick representation of TCP (courtesy of the Tratnyek Research Group). 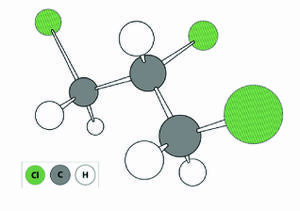 1,2,3-Trichloropropane is a man-made chemical that was used in the past primarily as a solvent and extractive agent, a paint and varnish remover, and as a cleaning and degreasing agent (Fig. 1). Currently, TCP is primarily used in chemical synthesis (e.g., synthesis of polysulfone liquid polymers used in the aerospace and automotive industries; hexafluoropropylene used in the agricultural, electronic, and pharmaceutical industries; polysulfide polymers used as sealants in manufacturing and construction; and 1,3-dichloropropene used in agriculture as a soil fumigant). TCP may be present in products containing these chemicals as an impurity. For example, the 1,2-dichlropropane/1,3-dichlropropene soil fumigant mixture (trade name D-D), which is no longer sold in the United States, contained TCP as an impurity and has been linked to TCP contamination in groundwater. Soil fumigants composed primarily of 1,3-dichlropropene, which are currently in use, may also contain TCP as an impurity (e.g., Telone II is reported to contain up to 0.17 percent TCP by weight). TCP contamination is problematic because it is "reasonably anticipated to be a human carcinogen" based on evidence of carcinogenicity to animals. Toxicity to humans appears to be high relative to other chlorinated solvents, suggesting that even low-level exposure to TCP could pose a significant human health risk. Table 1. Physical and chemical properties of TCP. See also ASTDR (1992) and Dombeck and Borg (2005). TCP’s fate in the environment is governed by its physical and chemical properties (Table 1). TCP is not anticipated to sorb strongly to soil making it likely to leach into groundwater and exhibit high mobility. In addition, TCP is moderately volatile and can partition from surface water and moist soil into the atmosphere. Because TCP is only slightly soluble and denser than water, it is capable of forming a dense non-aqueous phase liquid (DNAPL). TCP is generally resistant to biodegradation, hydrolysis, oxidation, and reduction under naturally occurring conditions making it highly persistent in the environment. TCP has been detected in ~1% percent of United States Geological Survey tested public supply and domestic well samples. More specifically, TCP was detected in 1.2% of public supply well samples collected between 1993 and 2007 and 0.66% of domestic supply well samples collected between 1991 and 2004. TCP was detected at a higher rate in domestic supply well samples associated with agricultural land-use studies than samples associated with aquifer studies (3.5% versus 0.2%). The United States Environmental Protection Agency (EPA) has not established a MCL for TCP, although guidelines and health standards are in place. TCP was included in the Contaminant Candidate List 3 and the Unregulated Contaminant Monitoring Rule 3 (UCMR 3). The UCMR 3 specified that data be collected on TCP occurrence in public water systems over the period of January 2013 to December 2015 against a reference concentration range of 0.0004 to 0.04 μg/L. The reference concentration range was determined based on a cancer risk of 10-6 to 10-4 and derived from an oral slope factor of 30 mg/kg-day determined for the EPA’s Integrated Risk Information System. Available partial UCMR 3 data published as of July 2016 indicate that TCP has been detected above the UCMR-specified minimum reporting level of 0.03 μg/L at 1.3% of monitored public water systems. At the state level, Hawaii is the only state that has established a MCL for TCP in drinking water. This MCL is 0.6 μg/L. California has established a notification level of 0.005 μg/L and a public health goal of 0.0007 μg/L. The state is currently in the process of developing a MCL for TCP and a preliminary recommendation of 0.005 μg/L was made public July 2016. Up-to-date information can be found at the California Environmental Protection Agency State Water Resources Control Board. In October 2016, the New Jersey Drinking Water Quality Institute recommended proposition and adoption of a 0.03-μg/L MCL based on a practical quantitation limit of the same value (a health based MCL of 0.0005 μg/L was recommended). TCP contamination in drinking water is typically treated using granular activated carbon (GAC). GAC is also applied for groundwater treatment in pump and treat scenarios. However, based on published Freundlich adsorption isotherm parameters, less TCP mass is adsorbed per gram of carbon compared to other volatile organic compounds (VOCs) such as tetrachloroethene and trichloroethene. This results in an increased carbon usage rate and treatment cost compared to these contaminants. Air stripping, air sparging, and soil vacuum extraction are also less effective compared to other VOCs because of TCP’s relatively low Henry’s Law constant. Figure 2. Summary of anticipated, primary reaction pathways for degradation of TCP. Oxidation, hydrolysis, and hydrogenolysis are represented by the horizontal arrows. Elimination (dehydrochlorination) and reductive elimination are shown with vertical arrows. [O] represents oxygenation (by oxidation or hydrolysis), [H] represents reduction. Gray indicates products that appear to be of lesser significance. Reprinted with permission from Sarathy et al. 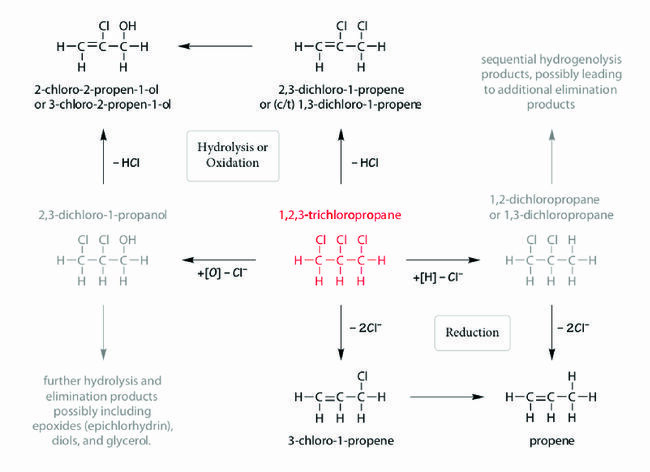 (2010) (Copyright 2010, American Chemical Society). Potential TCP degradation pathways include hydrolysis, oxidation, and reduction (Fig. 2). These overall pathways are expected to be similar for abiotic and biotic reactions, but the rates of the reactions (and their resulting significance) are dependent on natural and engineered conditions. Hydrolysis of TCP is negligible under ambient pH and temperature conditions, but is favorable at high pH and/or temperature. For example, ammonia gas can be used to raise soil pH and stimulate alkaline hydrolysis of chlorinated propanes including TCP. In situ thermal remediation may also produce favorable conditions for TCP hydrolysis. Oxidation using mild/specific oxidants like permanganate is negligible, but stronger oxidants like those used in in situ chemical oxidation (ISCO) (especially hydroxyl and sulfate radicals) do oxidize TCP. Reduction by naturally occurring reductants (i.e., those associated with natural attenuation) is negligible and granular zerovalent iron (ZVI) produces only slow reduction. Nano-scale ZVI and palladized ZVI produce faster reduction, but the reaction is not anticipated to be fast enough to be useful in typical remediation applications. Commercial-grade zerovalent zinc (ZVZ) reduces TCP relatively quickly under a range of laboratory and field conditions to produce propene without significant accumulation of intermediates. Aerobic biodegradation is not favorable as no naturally-occurring microorganisms have been identified that degrade TCP under aerobic conditions. Relatively slow aerobic cometabolism by the ammonia oxidizing bacterium Nitrosomonas europaea and other populations has been reportedSamin, G., Janssen, D.B., 2012. Transformation and biodegradation of 1,2,3-trichloropropane (TCP). Environmental Science and Pollution Research, 19(8), 3067-3078. doi:10.1007/s11356-012-0859-3</ref> and genetic engineering has been used to develop organisms capable of utilizing TCP as a sole carbon source under aerobic conditions. Anaerobic reductive dechlorination has been reported in enrichment cultures and multiple species within the genus Dehalogenimonas capable of anaerobic reductive dechlorination of TCP have been isolated from contaminated groundwater. A bioaugmentation culture containing Dehalogenimonas (KB-1 Plus, SiREM) is commercially available and has been implemented for remediation of TCP-contaminated groundwater. The relatively high toxicity of TCP has led to the development of low health-based drinking water concentration goals. TCP is present in groundwater and in public water systems at concentrations that exceed these health-based goals. While the EPA has not established a MCL for TCP, a handful of states have either established MCLs or are in the process of doing so. Because TCP is persistent in groundwater and it is resistant to typical remediation methods (or costly to treat), specialized strategies may be needed to meet drinking-water-based treatment goals. Research into TCP treatment is ongoing. ^ Office of Environmental Health and Hazard Assessment, California Environmental Protection Agency (OEHHA), 2009. Public Health Goals for 1,2,3-Trichloropropane in Drinking Water. August. ^ TetraTech, 2012. Report to the Hawaii Department of Health, Safe Drinking Water Branch, Regarding the Human Health Risks of 1,2,3-Trichloropropane in Tap Water. ^ Snoeyink, V.L., Summers, R.S, 1990. Adsorption of Organic Compounds, In: Pontius, F.W. (ed.). Water Quality and Treatment. New York, NY. McGraw-Hill. ^ Schmitt, M., Suchomel, E., 2016. 1,2,3-TCP Remediation in Groundwater: Biological Reduction and Chemical Reduction using ZVZ. Emerging Contaminants Summit. Westminster, CO. This page was last edited on 11 May 2018, at 20:59.